Chicken on the bone. Grrr. I hate chicken on the bone. I don’t know why, I guess because it reminds me of what I’m eating. Flesh of an animal. Hmmm. I prefer, as my sister puts it so delicately, to “buy all my meat all sanitized, cut up and put on styrofoam trays so that no animals were hurt in the process.” I know this is not very respectful to the animal, but it is what it is. That being said, I bought a big package of chicken thighs on sale at Publix and came home to find them skinless but on the bone. What to do? 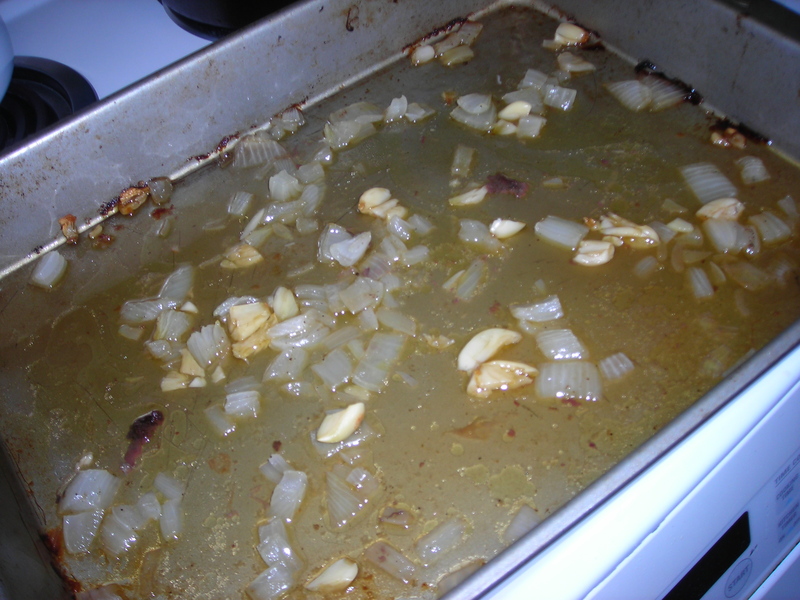 I decided that I would brown them in a skillet and roast them in the oven to make sure they got done. So, Chubby Hubby and I set about it. I rinsed the chicken and dried it well so it would crisp. Chubby Hubby seasoned it with salt and pepper, and assisted me in the searing process. 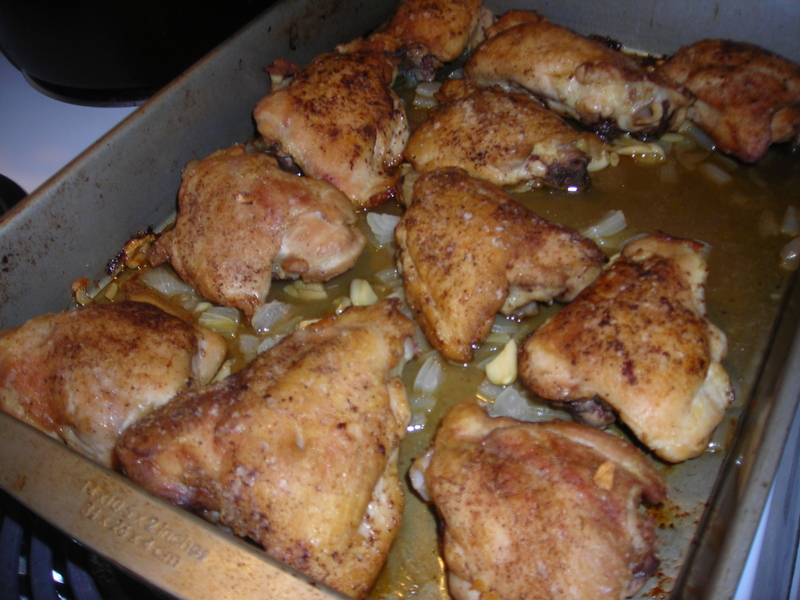 He seared and put the chicken in a roasting pan while I chopped an onion and several cloves of garlic to roast with the chicken. Make lemonade out of lemons, right? After this was done, we roasted the chicken, onions and garlic in a 425 degree oven for about 25 minutes (make sure the juices are running clear). Pulled it out, looks and smells YUMMY. Hmm, maybe this will be ok.
Now, what to do with all this chicken? Our answer: De-bone it and make some Chicken Pie. How do you make Chicken Pie? I’m glad you asked! 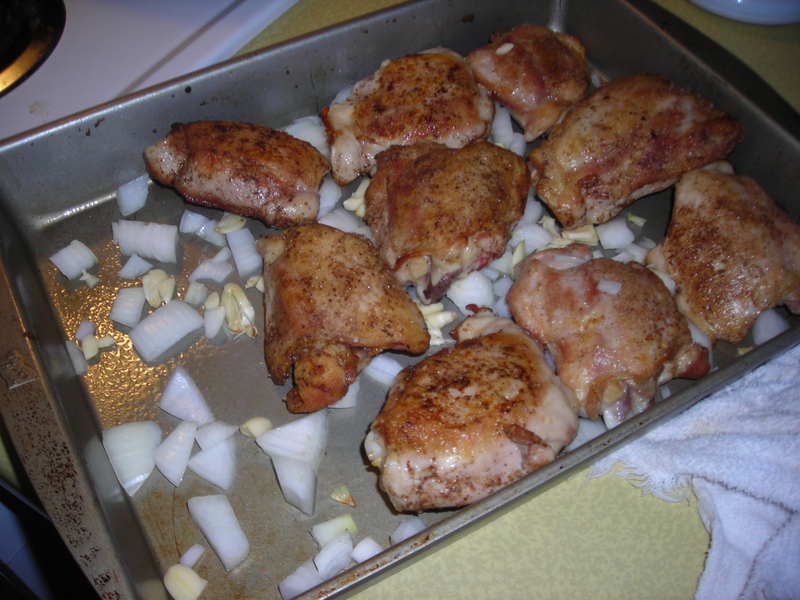 I de-boned and cut up the chicken into small cubes. Then, I looked at the vegetables I had. Hmm, just carrots and peas. Personally, I like some potatoes in my Chicken Pie, so I decided to cut up a couple of small white potatoes and blanch them (Note: just blanch, don’t cook completely. Remember that they will cook some more in the casserole). While they potatoes boiled, I combined the peas and carrots, chicken and cream of soups. The cream soups I used were Cream of Mushroom and Roasted Garlic and Cream of Chicken and Herbs. Stir together well in casserole dish. 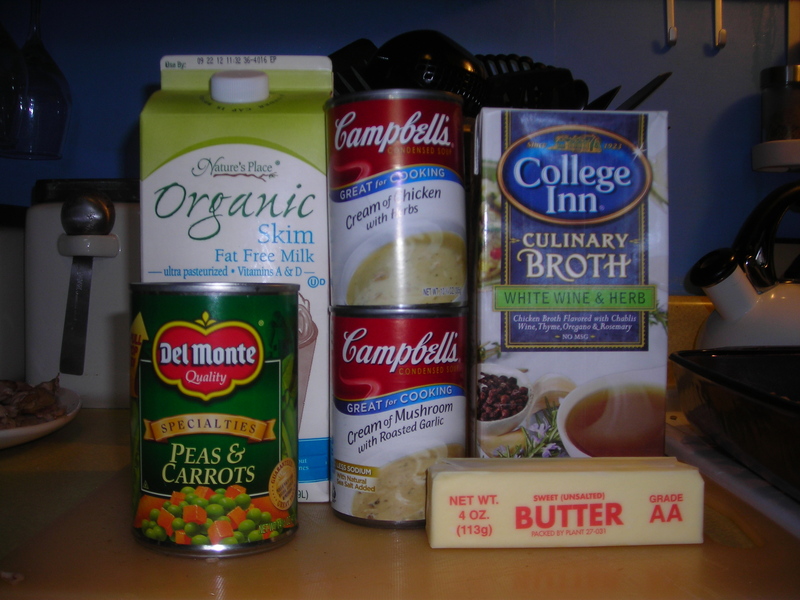 The proper amount of broth to use is the amount equal to one of the Cream of soup cans. So I strained the broth and added it to the can, came about to be about half of what I needed, so I added the store-bought stuff till I had enough. Stirred it all together till it was combined evenly. Add salt, pepper, and poultry seasoning now and stir it all together one more time. Now, it’s crust time. Now my mom (hi mom!) gave me this awesome recipe for crust for anything that needs crust. Just take a stick of cold butter, cut it into cubes, combine with 1 cup of flour until it looks like sand. Add 1 cup of milk and mix together. 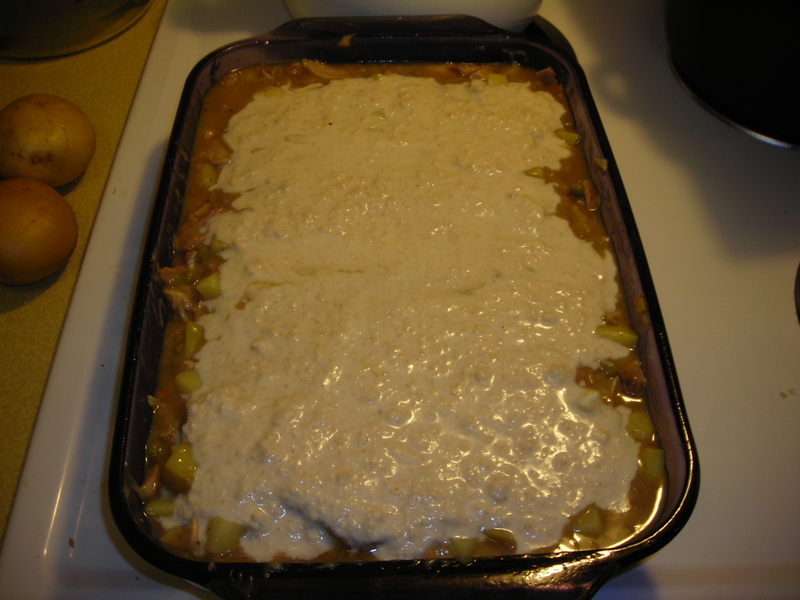 Pour this batter over the top of the casserole last thing. Now bake the Chicken Pie at 415-420 degrees for around 45 minutes. There are 2 sure-fire ways to tell when it’s done. 1) You give the casserole a slight shake in the oven (with a pot holder. Seriously. No lawsuits.) and if it’s still more wobbly than solid, it’s not done. When it’s fairly solid, you’re golden. 2) The crust turns beautiful golden brown. If you peek in the oven and the crust isn’t brown, give it another 5-10 minutes and check it. Voila! 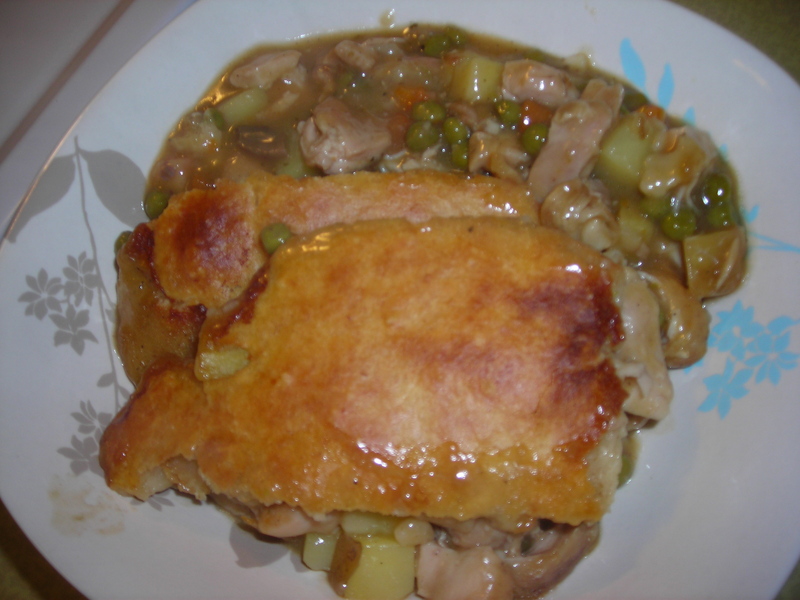 Yummy Chicken Pie that re-heats well for lunches and leftovers. I guess chicken on the bone is all right after all.